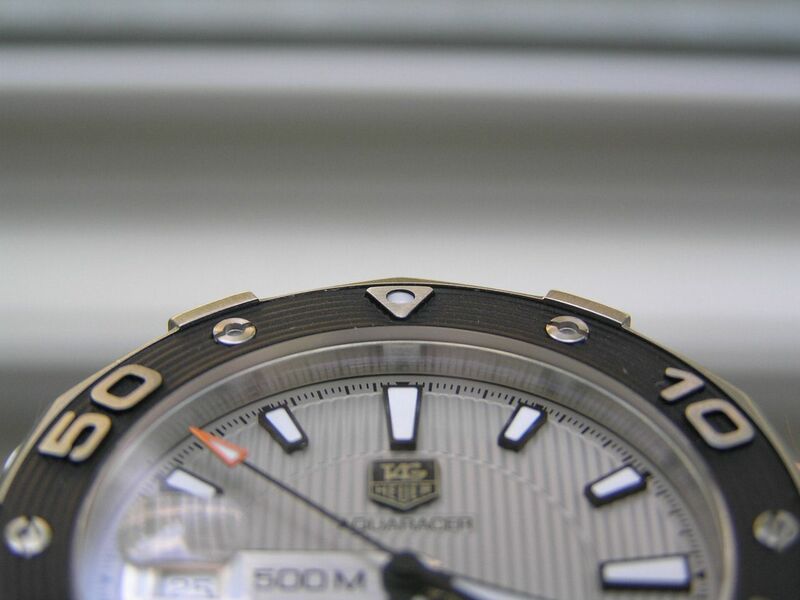 It seems many people these days consider Tag Heuer to be a ‘fashion’ brand, due in part to their advertising with various celebrity-type and athlete-based endorsements. But, don’t worry, if you’re a true WIS, Tag still has plenty of serious watches, some with fascinating movement technology that continues to push the envelope of what can be done with a mechanical watch movement. 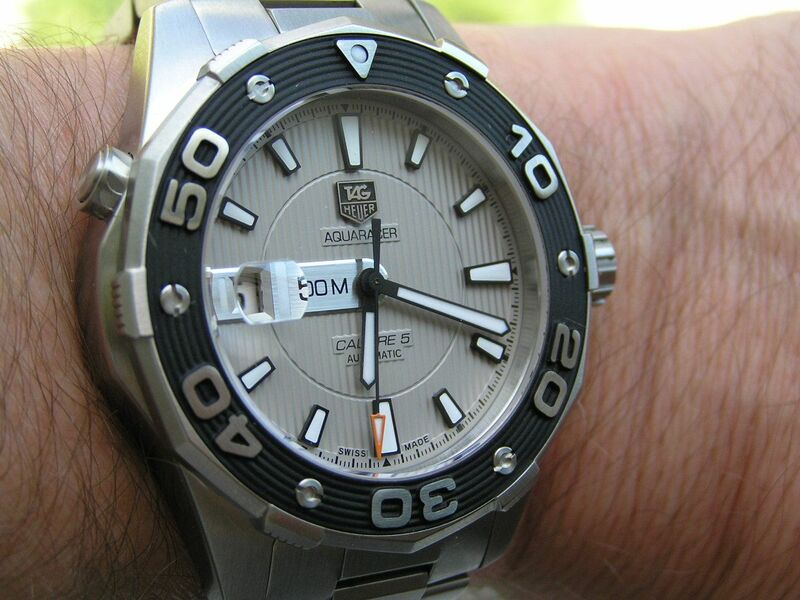 What I appreciate about Tag Heuer is that the brand has a true Swiss heritage and continues to produce great dive/tool watches, iconic models like the Monaco and the aforementioned bleeding edge movements to showcase their technical expertise. And to be honest, before I became a certified full-blown WIS, I always thought Tags were overrated. Not until I bought one did I come to appreciate their build quality, accuracy out of the box and overall design aesthetic. I currently own three Tags, which is the most of any one brand in my collection. The Aquaracer line is large and varied and I was drawn to the 500 meter models because of their unique looks and no-nonsense features. Fashion watches these are not! The Aquaracer 500 reviewed here starts with a fully brushed stainless steel case with angled sides that give the watch a bit more presence and heft. Case diameter is 43.5mm, but it really doesn’t wear that large. With the crown, the measurement is 48.2mm. Lugs are 21mm, case thickness is 13.3mm. The main screwdown crown is beautifully executed, with large, wide knurls for an easy grip and a black inset Tag logo. Crown guards extend from the case to protect the crown. On the opposite side of the case at the 10 position is the automatic helium escape valve (HEV), which has a knurled collar around it. 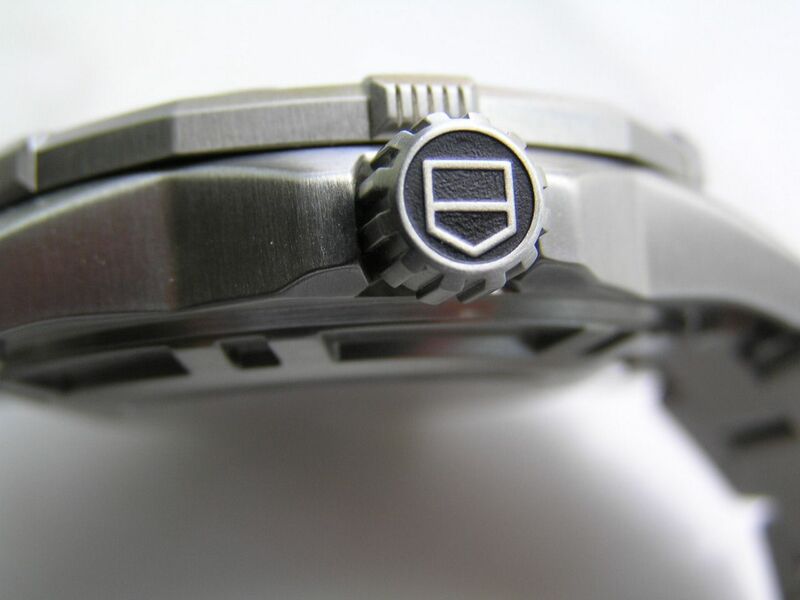 Unlike some HEVS (Rolex SeaDweller and Doxa Sub) that are flush fit with the case and unobtrusive, Tag (like Omega) chooses to have their HEV protrude from the case side. To each his own. The caseback on the Aquaracer 500 is a screwdown display type with a sapphire crystal showing off the suitably decorated Caliber 5 automatic movement. Some think a display back on a true dive watch is superfluous, but I don’t mind seeing the movement, especially when the time has been taken to decorate it like Tag has on the Aquaracer 500. And of course, the watch is rated at 500 meters of water resistance, so this is a serious dive watch. 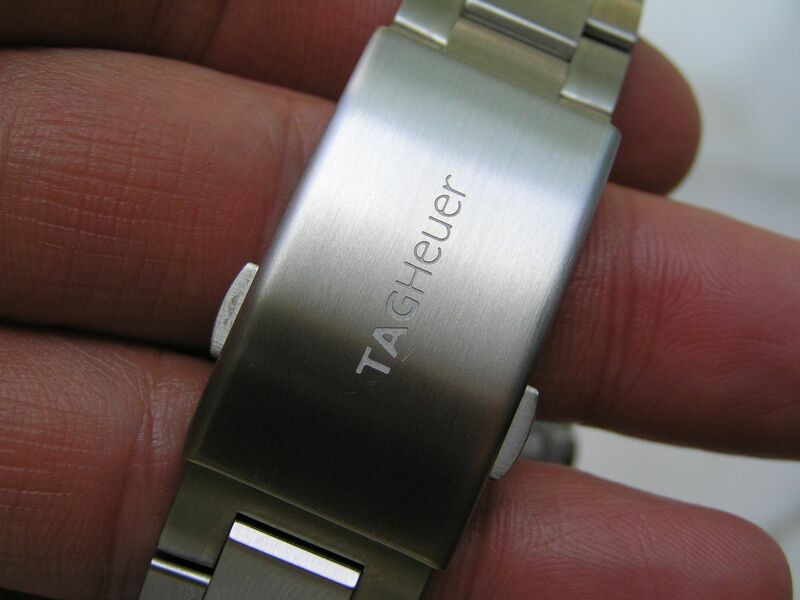 Tag has made the 120-click unidirectional bezel easy to turn while diving due to the rectangular pieces that extend slightly on the bezel every 10 minutes (Tag refers to them as ‘studs’), starting at the ‘five’ mark. The bezel does indeed turn easily, but doesn’t have a super high quality sound or feel to it and also has a very slight backlash. Not anything to deter one from purchasing this watch, but not the precision you might expect at this price point, either. The black inset on the bezel is matte paint and not a rubber piece; it looks good and gets the job done. At the five minute marks on the bezel sit stylized stainless steel screw heads, while stainless arabics are found at each 10 minute mark. 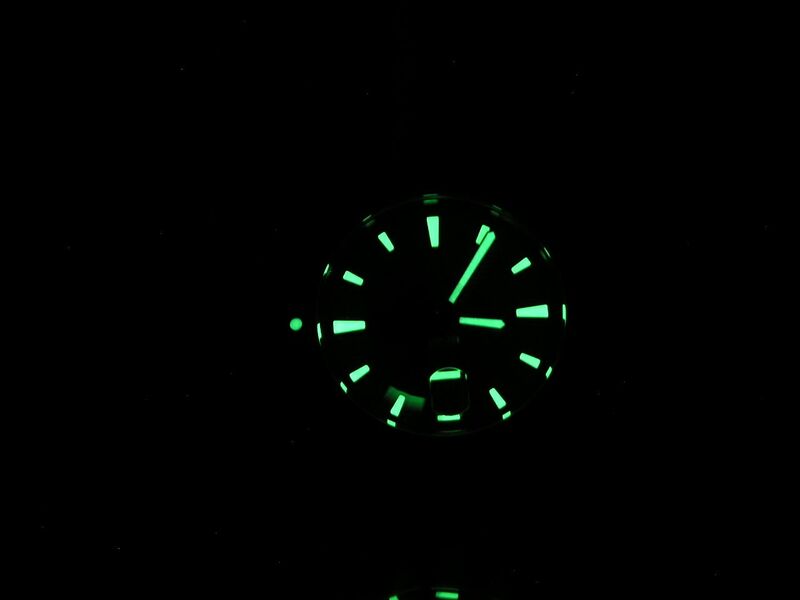 A small lume pip sits in the triangle on the bezel at 12. The dial is what really attracted me to this watch. I love the silver/grey shade and the vertical ribbing that adds dimension and appeal to this watch without looking novel or gimmicky. The markers are hand applied and luminous, as are the black outline hands. The seconds hand is black with an orange luminous tip. Lume quality is excellent, as it should be for a serious dive watch. A magnified quickset date resides at the 9 position, 180 degrees opposite the standard 3 position where most dates are placed. This unique placement works fine and the external cyclops does a fine job of magnifying the black on white date wheel. Both the cyclops and date wheel are properly centered. 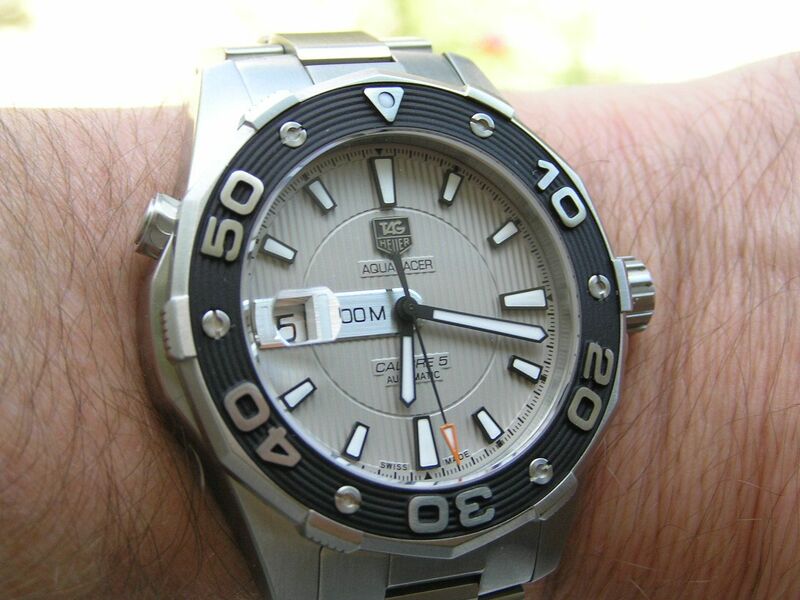 Minimal lettering on the dial includes an applied Tag Heuer logo below the 12, along with the model name ‘Aquaracer.’ Above the six is ‘Caliber 5’ and ‘Automatic.’ Next to the date window at the 9 position, a silver escutcheon sits between the date window and the hand pinions with ‘500M’ printed in black. 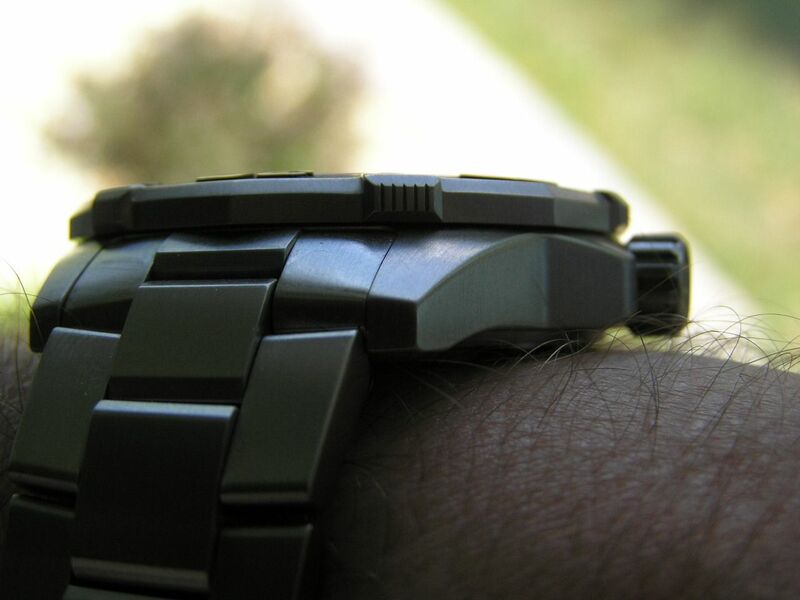 This is a bit stylized, but doesn’t detract from the overall functionality of this watch. 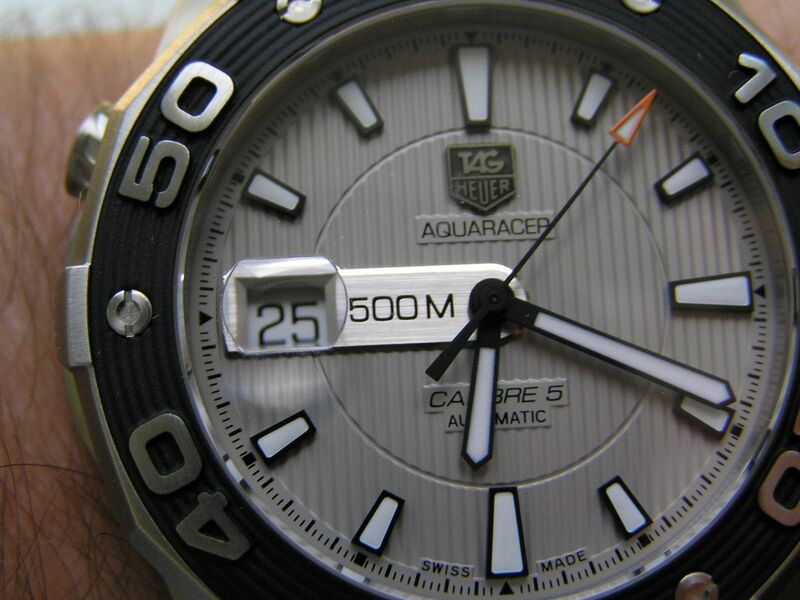 To reiterate, I think the dial execution on the Aquaracer 500 is first rate and a joy to look at. The design of the markers and hands makes this watch very legible, and as I get older, I appreciate legibility more and more. A flat sapphire crystal covers the dial and is very slightly raised above the bezel. No distortion has been noted with the crystal. Inside the Aquaracer 500 beats Tag’s Caliber 5 automatic movement. 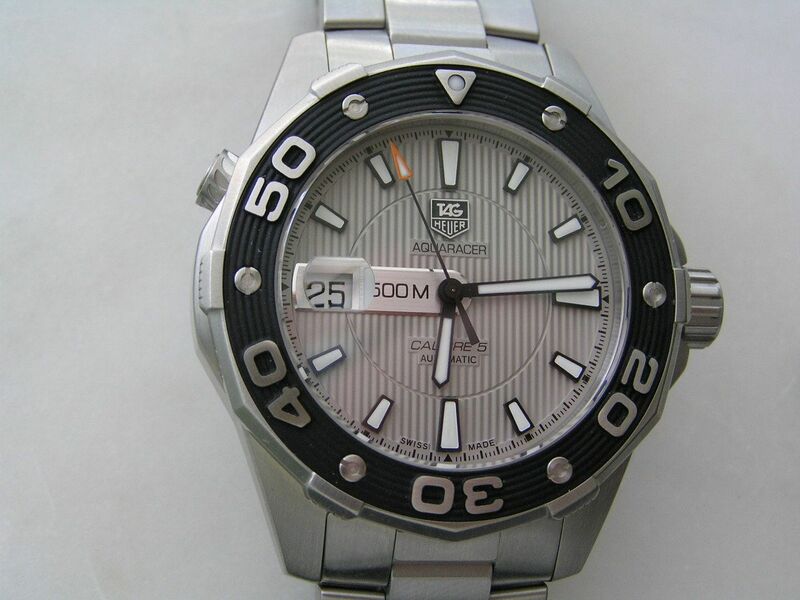 As far as I know, this is a decorated and modified base ETA automatic, with 25 jewels running at 28,800 vph. 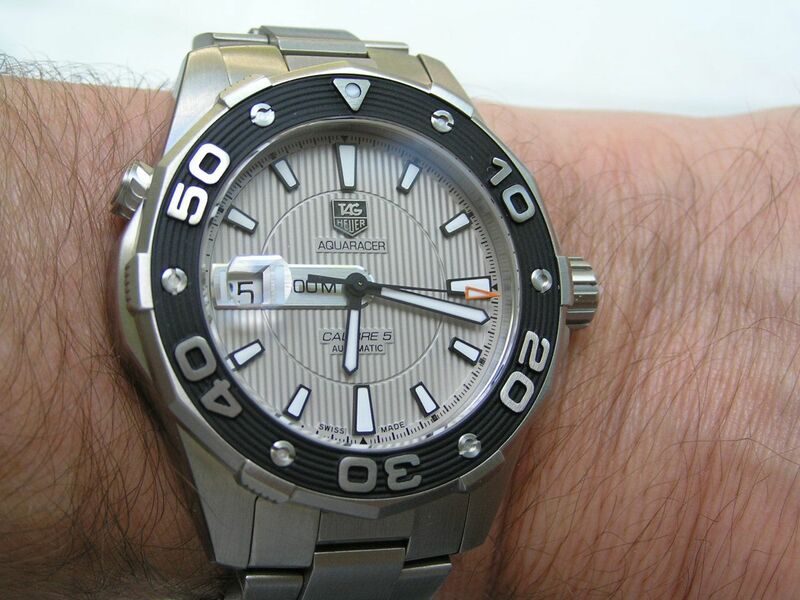 One thing I really enjoy about the three Tag Heuers I own is their accuracy right out of the box. Even though none of the Tags I own are COSC rated, they all keep chronometer time well within COSC standards. Impressive! And the Aquaracer has been no exception, running almost at zero deviation over 24 hours on the bench and during wearing at about +2/24 hours. Power reserve is the expected 42-1/4 hours (Tag specs power reserve at 38 hours). 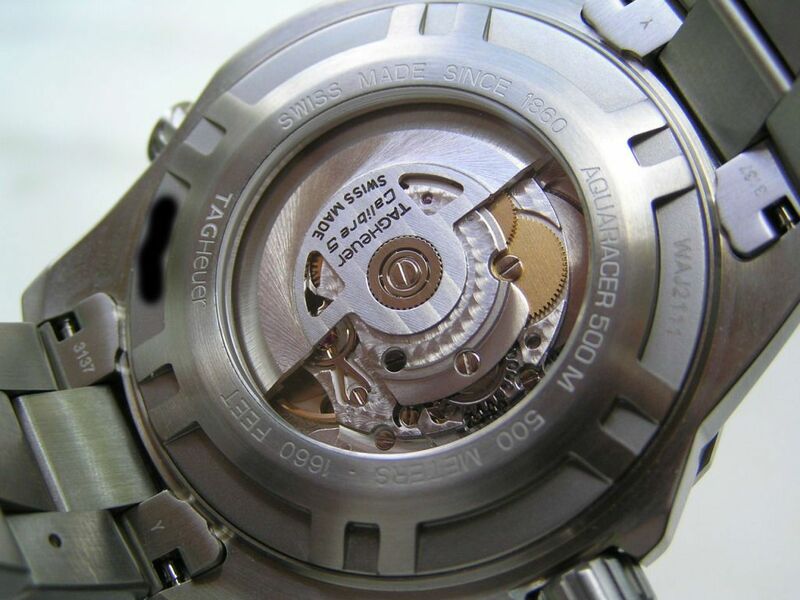 Tag has decorated the Caliber 5 with Cotes de Geneve stripes on the signed rotor and various plates and bridges on the movement decorated with perlage. Overall, a nice presentation and a bit unexpected in a serious tool watch. 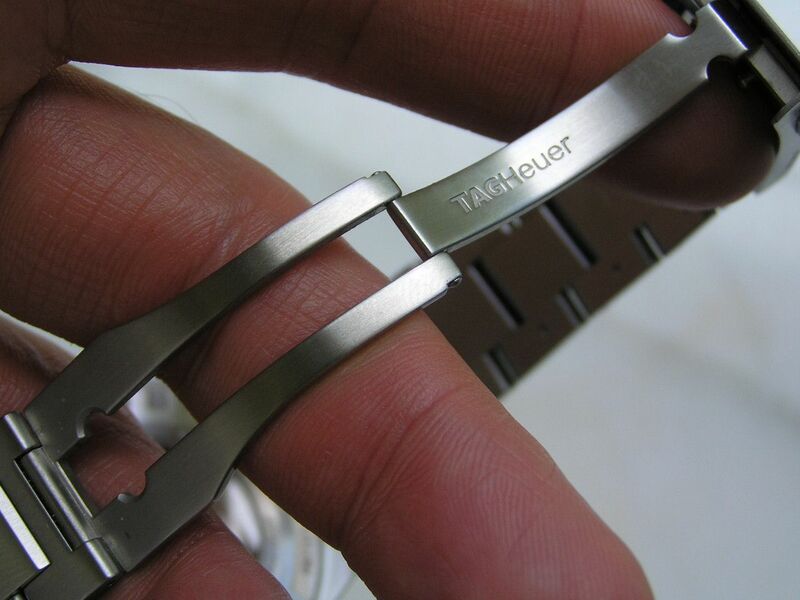 The bracelet is typical Tag quality, meaning very good. 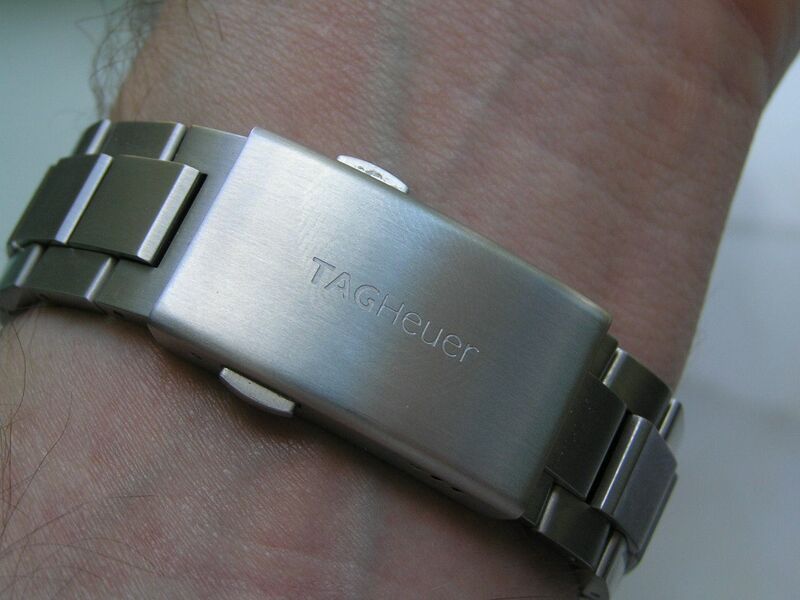 It sports brushed solid stainless steel links, with the center links being slightly raised above the outer links, one of Tag’s signature styles. 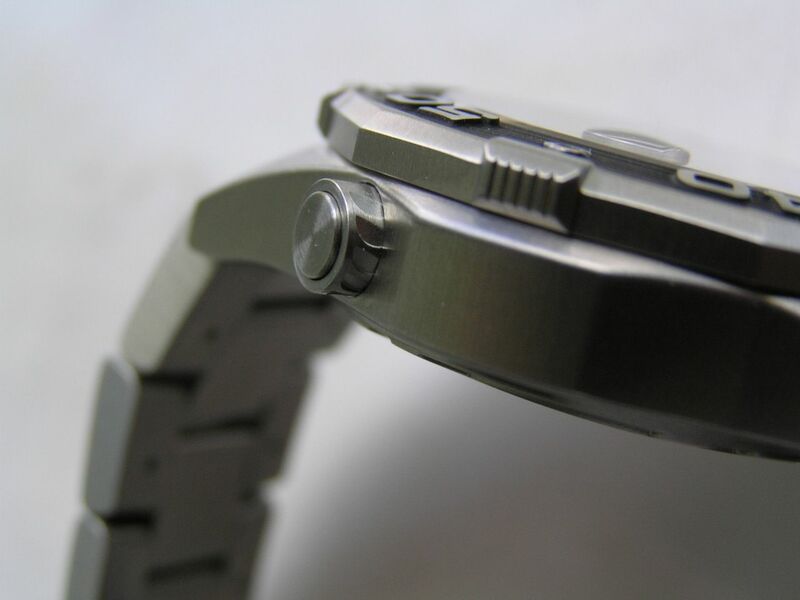 Solid end links, a pushbutton signed clasp and a signed machined deployant complete the features. Demerits for the rather cheap stamped steel diver extension. There are three microadjustment holes on the clasp and link adjustment is accomplished via a pin and collar system which did not present any problems. 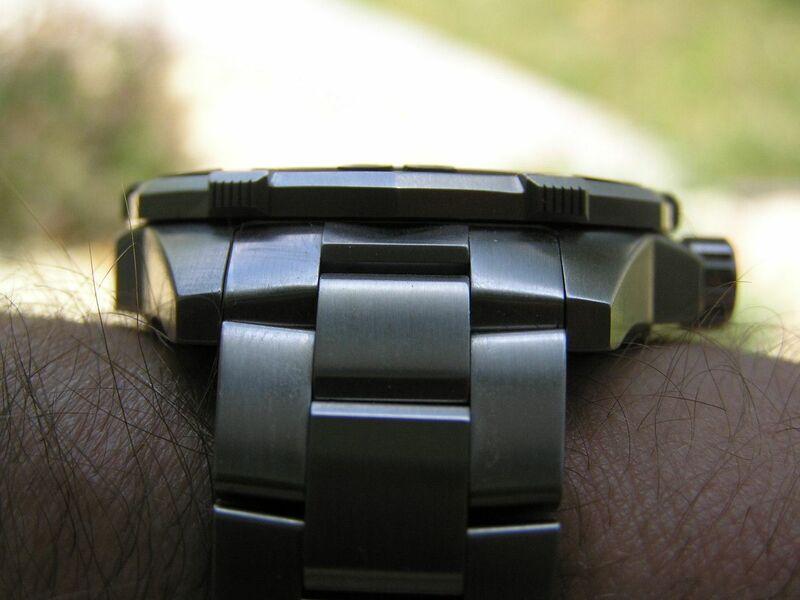 The bracelet measures 21mm at the lugs and tapers to about 18mm at the clasp. Presentation is standard Tag with a black heavy cardboard outer box and black padded hard inner box with separate leatherette instruction and warranty holder. Overall, the Tag Heuer Aquaracer 500 combines a serious diver watch with just enough style to make it a great daily wearer. It looks neither too purposeful or too fashionista, which is a good thing. A great choice for the pool or the daily scrum. Verdict: a perfect watch for work and play, it can take what you dish out while looking the part of a Tag, stylish and functional at the same time. Superbly executed! Mark. I'm a 53. Male and inhave never had a realnwatch. I just received a good promotion and want to splurge. Ive always liked the tag and I like the look of the acquamaster. I can spend up to2K. Do you have any suggestions for a newbie? 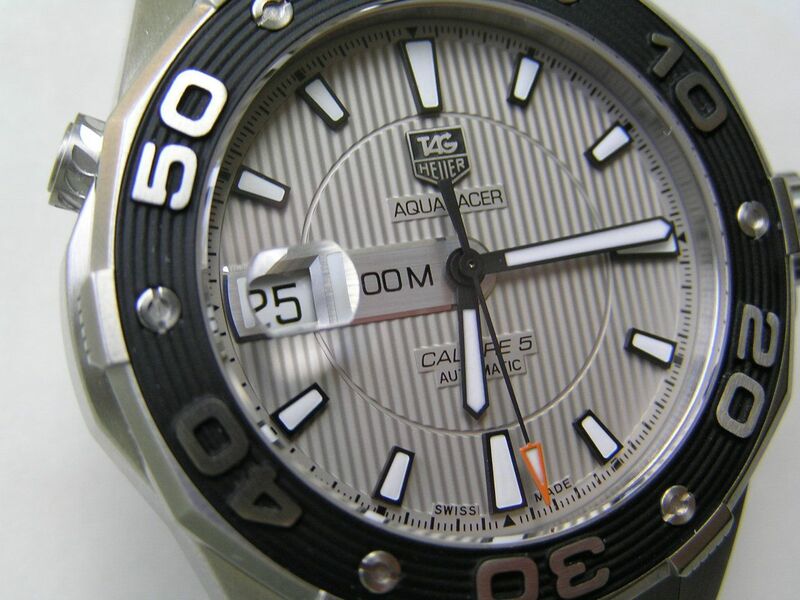 The Tag Aquaracer 500 is a fine choice and can be had for less than $2K used. A used Breitling Colt II (see my review elsewhere on this blog) is another choice in the price range you mention, along with used Omegas like a Speedmaster or Seamaster Pro. Any of these would be a great start for 'real' watch ownership as you say. Sadly, I have to report a less than positive experience with my own Tag. I've coveted Tags for years and finally acquired one brand new, and from a reputable jeweler, in April 2011. The second hand quit moving a month ago so I took it in and had it sent away for service. The verdict: the movement needs to be overhauled, the watch requires new gaskets, a new battery, and a new water seal. All this for a watch which is never taken diving (or even in the shower), never worn during yard work, and never subjected to anything more stressful than hanging around my wrist while I work on my laptop. Oh, and the estimate is $350! After protesting mightily, I was offered a $50 "accommodation" because the warranty, of course, expired 3 months before the second hand quit. To say I am disappointed in the quality of this watch, and in LVMH's refusal to stand behind their product, would be a profound understatement. 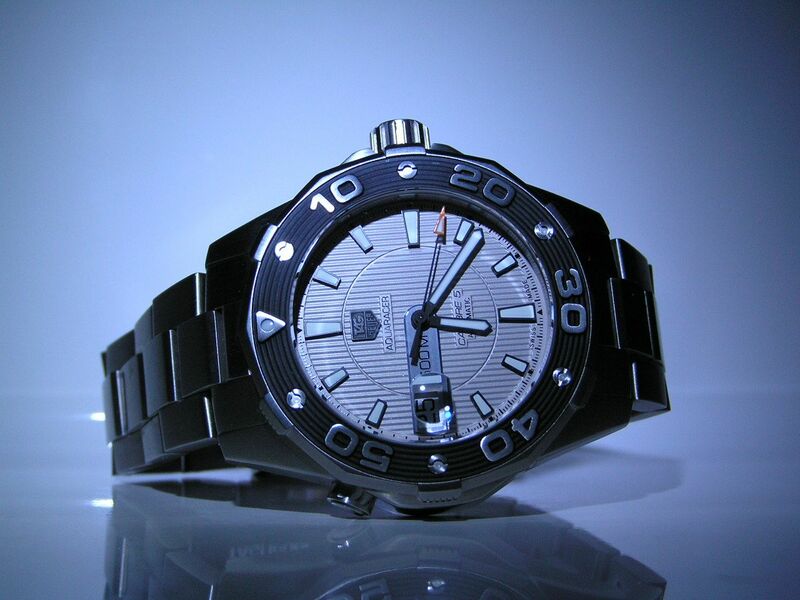 I like the design, but I hate the quality and the fact that I have been "taken" for a ride on a luxury watch. I will never, ever recommend that anyone buy a Tag and I will never purchase a second one myself.